through the lives of holy people, through prayers, spirituality, and acts of love. - United States Catholic Catechism for Adults. If needed, other celebration times can be arranged with the Director of Religious Education and the Presider. 1. Register in the parish if not already a member. 2. Call the Parish Office at 330-758-2325 to schedule a date and time. 3. Make arrangements to attend the parent preparation class. Reservations required. 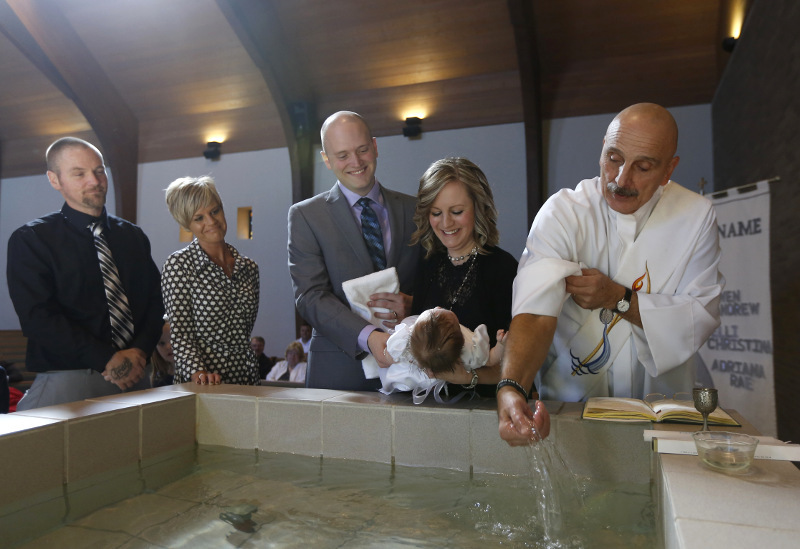 St. Charles Parish presumes that parents who are requesting the baptism of their child or children intend to raise them in the Catholic Faith and Catholic practices. If this is not the intention, Baptism should be postponed and consultation with a priest or the Director of Religious Education should be scheduled. Finding its origins in the words of Jesus at the Last Supper, “Do this in memory of Me,” the Eucharist is Christ’s saving life, death, and Resurrection made present for us. Under the appearance of ordinary wheat and wine, the Sacred Bread and Precious Blood increases our union with the Lord, enabling us to live more completely the Good News in a world so desperately in need of this message. Eucharist is celebrated for the first time in the second grade. Before the reception of this sacrament, the children must have two full years of catechetical preparation. Those not having two years must go through a special process. In such a case, the Director of Religious Education should be notified. The Sacrament of Reconciliation focuses on God’s merciful love. Celebration of this sacrament takes place every Saturday from 2:30-3:30 p.m., or by appointment by calling 330-758-2325. Communal celebrations are scheduled during the seasons of Advent and Lent. 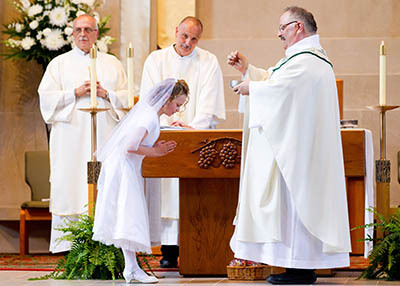 At the present time, the Diocese of Youngstown has determined that the sacrament will be celebrated in the eighth grade. Preparation for the sacrament is incorporated into the catechetical sessions and religion classes of the 8th grade CCD and school students. For individuals wishing to become Catholic, opportunity for the reception of the Sacraments of Baptism, Eucharist, and/or Confirmation is available during the Easter Vigil after participation in the RCIA program. Reconciliation is offered prior to the Vigil. Interested individuals should contact Deacon Paul Lisko for more information. 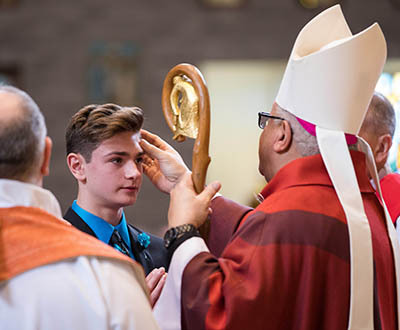 Adults who are Catholic wishing to receive a sacrament that they have not received, may attend the RCIA sessions that provide education in the particular area needed and receive the sacrament at the Easter Vigil. Children needing the sacraments are coordinated by Deacon Paul Lisko. Reflecting the covenant relationship between God and His people, the Church views the Sacrament of Marriage as a permanent union between husband and wife, both are capable of knowing and loving each other and God. The Sacrament of Marriage is one, which requires special consideration and preparation. 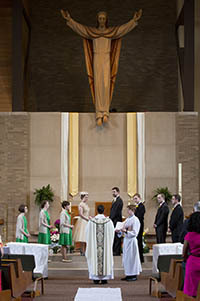 According to Diocesan policy, persons requesting to be married at St. Charles Parish must contact the parish office six months in advance of the desired date for the wedding. The couple should be active parishioners, that is, those who attend Mass regularly. After scheduling a date with the priest or deacon who is presiding at the ceremony, they will meet with him on at least two occasions. They will also meet with a parish sponsor couple or participate in an engaged encounter retreat. Jesus came to heal the whole person body and soul. Anointing of the Sick is a sacrament for the faithful who are aged or in ill health. In the Church’s Sacrament of the Anointing of the Sick through the ministry of the priest, it is Jesus who touches the sick to heal them from sin, and sometimes even from physical ailment. There are two communal celebrations in October and May, offered at St. Charles each year. For individual anointing, at any time, please call the parish office at 330-758-2325.